US social media is said to be “buzzing” about treasure hunting and many TV programmes about it are being aired. Inevitably the format has spread here with “Hoard Hunters” and even the PAS-inspired “Britain’s Secret Treasures” (after which sales of detectors rocketed). 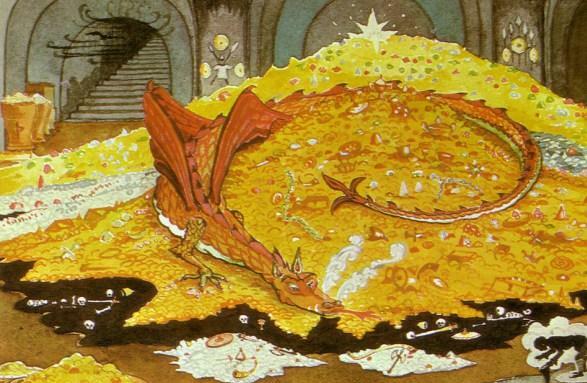 Tolkein’s Smaug: academic, conservationist or cacheologist? What if it isn’t baloney? What if we get lots of British “cacheologists” lawfully targeting archaeological sites in the hope of finding treasure caches and claiming it was “for the expansion of mankind’s study“? Would the Government approve, despite the damage caused in the process? Well, we know the answer. It’s a resounding “yes” for there are many thousands of people out today doing exactly that. Are we now to see the emergence of ‘Artefology’ ?